Louisiana native plants perfectly designed for our heat, humidity, high rainfall, and adapted to our soils and pests. 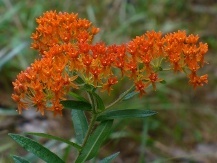 From a wide selection of Liatris and truly perennial Rudbeckias to vines like the tame Coral Honeysuckle as well as the rare but beautiful Louisiana Catchfly. These natives attract a host of pollinators from hummingbirds to butterflies as well as native bees and other garden beneficials so be sure to add them to your gardens, landscapes, and wildscapes like meadows and prairies. The dainty white flowers of spring are soon followed by bumpy green fruits that mature to pink and then nearly to red. Once fully mature the pods split open to display the bright orange seeds inside giving it the name of Hearts-A-Burstin'. The American Strawberry bush is typically a deciduous to tardily deciduous large shrub (this selection seems to be more consistently evergreen) with green stems and dark to medium green, somewhat glossy foliage that is native to much of the eastern and central US. Excellent fall color in oranges, reds, and yellows. Images of fruit courtesy of Susan Thomas Spell. Item# 10218. Anna's Choice Yaupon Holly produces loads of golden yellow berries in dense clusters that last well into spring or until the birds decide they are ripe, whichever comes first. 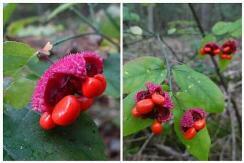 Either way we get all fall and winter to enjoy the beauty this durable native evergreen shrub provides. Anna's Choice is a vigorous upright to spreading evergreen shrub that is resistant to deer, salt, and is tolerant of a variety of moisture conditions from periodic droughts to periodic flooding. Item# 10202. Large clusters of white late spring flowers produce green berries that ripen to a blue-black. The flowers attract butterflies, bees, and other pollinators and the edible fruits attract a variety of wildlife, especially birds. Arrowwood Viburnum is a vigorous growing, naturally rounded, multi-stemmed deciduous shrub with rich green foliage and is tolerant of a wide range of growing conditions. Fall color includes yellows, orange, reds, and near purple. Arrowwood Viburnum makes an easy hedge, background specimen, or screen. Easy and reliable. Item# 10320. 2-3" wide, yellow sunflowers are born along the tall stems in summer on this durable native perennial. The Ashy Sunflower will spread and develop into a ground covering mass of plants with age. Contrasting soft, gray green foliage. Easy, drought tolerant, and reliable even for tough locations. Use it as a mass planting for large areas or in native gardens and meadows. Native to nearly all of the eastern half of the US. Item# 10418. Large spikes of deep blue, tubular flowers are born in summer, late summer, and sometimes into fall on this clump forming native perennial wildflower. 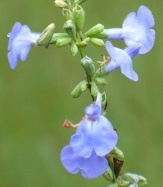 Under natural conditions Azure Blue Sage produces tall arching stems that terminate into large, often branching, spikes of flowers that are quite suited to use by Hummingbirds and butterflies. Great at the back of the garden or in natural settings. Item# 10460. Round clusters of lavender to white tubular flowers are born in summer on this durable native perennial. Wild Bergamot is a clump forming native perennial with good deer resistance. Excellent for hummingbirds and butterflies. This tough little native is drought tolerant and prefers to be on the dry side of moist and is resistant to drought once well-established. 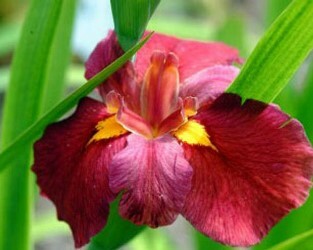 The fragrant foliage has been used in teas, perfumes, potpourri, and more. Item# 10484. Large, 3-4", blue, cornflower-like daisies are born in summer on this durable and reliable US native perennial. 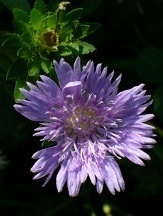 Stoke's Aster comes highly recommended and its easy to see why with moderate drought resistance, few pest or disease problems, deer and rabbit resistance and it revels in the heat and sun of our southern summers. Plants readily multiply into dense clumps. Super easy and tough. Item# 1212. With some of the deepest blue flowers of any Amsonia and a consistently compact habit, Blue Ice has become one of the most popular Bluestar cultivars on the market. 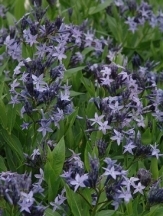 The clusters of deep blue, starry flowers open from deep violet buds and will be sure to brighten any spring garden. Yellow fall color adds to its interest. Bluestars are pest, disease, and deer resistant perennials that are considered to be somewhat drought resistant once well-established. Item# 10652. Flat topped clusters of bluish-purple Ageratum-like flowers are born atop sturdy stems in summer and sometimes into fall. Blue Mistflower is a rhizomatous colonizing native perennial that may be best suited to naturalistic settings or among larger growing plants as a tall groundcover. Excellent for pollinators, particularly native bees. Item# 10458. Clusters of soft lavender pink, nicely fragrant flowers are borne in loose clusters in spring. The rich dark green, narrow foliage is nearly immune to powdery mildew! A vigorous ground-covering perennial that flowers over an extended period and attracts butterflies. Item# 3062. An improved 'Magnus' type purple coneflower with large outward facing pinkish-purple petals and an orange 'cone' and are borne in summer and often last into fall. 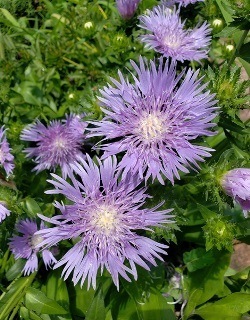 The flowers are held on sturdy, 2-3' stems. An outstanding selection of our native Purple Coneflower! A superb butterfly nectar plant. Item# 9696. Broadleaf Barbara's Buttons produces clusters of white to light lavender flowers atop short stems in mid-spring. A dainty and rhizomatous denizen of open and disturbed areas along stream banks and deciduous forests in the southeastern US. The rosettes rarely seem to exceed a few inches high even when it is in flower and it is not an aggressive spreader making it a welcome addition to woodland and other naturalistic settings. Item# 10767.